Earners of the Yoga Teacher Training (YTT) certificate are able to create, guide, and manage a yoga class in traditional Hatha and Vinyasa yoga sequences. They will have the ability to address and articulate proper awareness of a student's personal needs, both physically and mentally. Certificate earners will bring 200 plus hours of intensive training experience to classes they instruct. They will meet Yoga Alliance 200 hour certification standards. 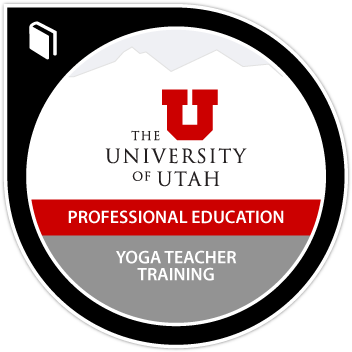 Complete University of Utah ESSF 800 which includes a guided focus on history of yoga, philosophies, and the metaphysical energies associated with yoga practice. Complete University of Utah ESSF 801 - practicum course with application and active exercises. Complete University of Utah ESSF 802 - workshop series and guest lectures. Active application of techniques and instruction. Complete Solo Teaching Requirement / Final which requires 10 hours of classes as solo instructor. Teachers can register as a RYT® 200 if they have successfully completed a 200-hour yoga teacher training program that is registered with Yoga Alliance.